Alfred Emanuel "Al" Smith (December 30, 1873 – October 4, 1944) was elected Governor of New York four times, and was the Democratic U.S. presidential candidate in 1928. He was the first Roman Catholic and Irish-American to run for President as a major party nominee. He lost the election to Herbert Hoover. He then became president of the Empire State, Inc. and was instrumental in getting the Empire State Building built during the Great Depression, thus creating one of America's most well-known landmarks. He put welfare issues high on his political agenda, working to improve housing for lower income earners, for the reform of factory laws, children's care, care of the mentally ill among other goals. He conducted his political business in such a way as to avoid polarization where possible, and presented legislation in such a way as to attract Republican support where possible. He tried to serve the many, not the few and to reduce the influence of small but powerful interests. Smith was born to Alfred Emanuel Smith and Catherine Mulvihill and initially grew up in the multiethnic Lower East Side of Manhattan, on Oliver Street, New York City, within sight of the Brooklyn Bridge which was then under construction. His four grandparents were Irish, German, Italian, and English, but Smith identified with the Irish American community and became its leading spokesman in the 1920s. He was 13 when his father Alfred, a Civil War veteran who owned a small trucking firm, died; at 14 he had to drop out of parochial school, Saint James School, to help support the family. He never attended high school or college, and claimed that he learned about people by studying them at the Fulton Fish Market, a job for which he was paid $12 per week to support his family. An accomplished amateur actor, he became a notable speaker. On May 6, 1900, Alfred Smith married Catherine A. Dunn, with whom he had five children. In his political career, he traded on his working-class beginnings, identified himself with immigrants, and campaigned as a man of the people. Although indebted to the Tammany Hall political machine, particularly to its boss, "Silent" Charlie Murphy, he remained untarnished by corruption and worked for the passage of progressive legislation. Smith's first political job was as a clerk in the office of the Commissioner of Jurors in 1895. In 1903 he was elected to the New York State Assembly. He served as vice chairman of the commission appointed to investigate factory conditions after a hundred workers died in the disastrous Triangle Shirtwaist Factory fire in 1911. Smith crusaded against dangerous and unhealthy workplace conditions and championed corrective legislation. In 1911 the Democrats obtained a majority of seats in the state Assembly, and Smith became chairman of the powerful Ways and Means Committee. In 1912, following the loss of the majority, he became the minority leader. When the Democrats reclaimed the majority in the next election, he was elected as Speaker of the Assembly for the 1913 session. He became minority leader again in 1914 when the Republicans won the majority again, and remained in that position until his election as sheriff of New York County in 1915. By now he was a leader of the Progressive movement in New York City and state. His campaign manager and top aide was Belle Moskowitz, daughter of Prussian-Jewish immigrants. After serving in the patronage-rich job of sheriff of New York County beginning in 1916, Smith was elected governor of New York in 1918 with the help of Tammany Boss Charles F. Murphy and a young James A. Farley, who brought Smith the upstate vote. He was the first Irish-American to be elected governor of a state. In 1919 he gave the famous speech, "A man as low and mean as I can picture," making an irreparable break with William Randolph Hearst. Newspaperman Hearst was the leader of the left-wing of the Democratic party in the city, and had combined with Tammany Hall in electing the local administration; he had been attacking Smith for "starving children" by not reducing the cost of milk. Smith lost his bid for re-election in 1920, but was reelected as governor in 1922, 1924 and 1926 with James A. Farley serving as his campaign manager. As governor Smith became known nationally as a progressive who sought to make government more efficient and more effective in meeting social needs. His young assistant, Robert Moses, constructed the nation's first state park system and reformed the civil service system; Smith later appointed him New York State Secretary of State. During his term New York strengthened laws governing workers' compensation, women's pensions, and child and women's labor with the help of Frances Perkins, soon to be Franklin Delano Roosevelt's Labor Secretary, and ahead of many states. In 1924 he unsuccessfully sought the Democratic nomination for president, advancing the cause of civil liberty by decrying lynching and racial violence. Roosevelt made the nominating speech in which he saluted Smith as "the Happy Warrior of the political battlefield." The Republican Party was riding high on the economic boom of the 1920s, which their presidential candidate Herbert Hoover pledged to continue. 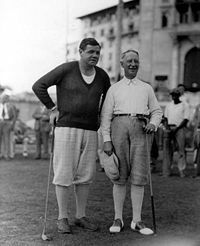 Historians agree that the prosperity along with anti-Catholic sentiment made Hoover's election inevitable, although he had never run for office. He defeated Smith by a landslide in the 1928 election. Smith was the first Catholic to win a major-party presidential nomination. (See also John F. Kennedy, the first Catholic elected U.S. President.) A major controversial issue was the continuation of Prohibition. Smith was personally in favor of relaxation or repeal of Prohibition laws despite its status as part of the nation's Constitution, but the Democratic Party split north and south on the issue. During the campaign Smith tried to duck the issue with noncommittal statements. Smith was an articulate exponent of good government and efficiency as was Hoover. But as Smith became known for saying in his campaign, "Let's look at the record." Smith swept the entire Catholic vote, which had been split in 1920 and 1924, and brought millions of Catholic ethnics to the polls for the first time, especially women. He lost important Democratic constituencies in the rural north and in southern cities and suburbs. He did carry the Deep South, thanks in part to his running mate, Senator Joseph Robinson of Arkansas, and he carried the ten most populous cities in the United States. Part of Smith's losses can be attributed to fear that as president, Smith would answer to the Pope rather than to the Constitution, to fears of the power of New York City, to distaste for the long history of corruption associated with Tammany Hall, as well as to Smith's own mediocre campaigning. Smith's campaign theme song, "The Sidewalks of New York," was not likely to appeal to rural folks, and his city accent on the "raddio" seemed a bit foreign. Although Smith lost New York State, his ticket-mate Roosevelt was elected to replace him as governor of New York. Ironically it was James A. Farley who left Smith's camp to run Franklin D. Roosevelt's successful campaign for Governor, and later Roosevelt's successful campaigns for the Presidency in 1932 and 1936. In long-term perspective Al Smith started a voter realignment. He helped launch the end of classless politics that ushered in the New Deal coalition of Franklin D. Roosevelt. 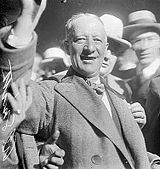 As one political scientist explains, "… not until 1928, with the nomination of Al Smith, a northeastern reformer, did Democrats make gains among the urban, blue-collar, and Catholic voters who were later to become core components of the New Deal coalition and break the pattern of minimal class polarization that had characterized the Fourth Party System." Christopher M. Finan says Smith is an underestimated symbol of the changing nature of American politics in the first half of the century. He represented the rising ambitions of urban, industrial America at a time when the hegemony of rural, agrarian America was in decline. He was connected to the hopes and aspirations of immigrants, especially Catholics and Jews. Smith was a devout Catholic, but his struggles against religious bigotry were often misinterpreted when he fought the religiously inspired Protestant morality imposed by prohibitionists. Smith felt slighted by Roosevelt during Roosevelt's governorship. They became rivals for the 1932 Democratic presidential nomination. After losing the nomination, Smith begrudgingly campaigned for Roosevelt in 1932. When President Roosevelt began pursuing the liberal policies of his New Deal, Smith began to work with the opposition. Smith believed the New Deal was a betrayal of good-government Progressive ideals, and ran counter to the goal of close cooperation with business. Along with other prominent conservative Democrats, in 1934 he became a leader of the American Liberty League, the focus of political opposition to Roosevelt's New Deal. Smith supported the Republican presidential candidates Alfred M. Landon in the 1936 election and Wendell Willkie in the 1940 election. Although personal resentment was a motivating factor in Smith's break with Roosevelt and the New Deal, Smith was consistent in his beliefs and politics. Finan argues Smith always believed in social mobility, economic opportunity, religious tolerance, and individualism. After the 1928 election, he became the president of Empire State, Inc., the corporation which built and operated the Empire State Building. Construction for the building was commenced symbolically on March 17, 1930, per Smith's instructions, as president of the corporation. Smith's grandchildren cut the ribbon when the world's tallest skyscraper opened on May 1, 1931—May Day—built in only 13 months. As with the Brooklyn Bridge, which Smith witnessed being built from his Lower East Side boyhood home, the Empire State Building was a vision and an achievement constructed by combining the interests of all rather than being divided by interests of a few. Smith, like most New York City businessmen, enthusiastically supported World War II, but was not asked by Roosevelt to play any role in the war effort. In 1939 he was appointed a Papal Chamberlain, one of the highest honors the Papacy bestows on a layman. Smith died on October 4, 1944, at the age of 70, broken-hearted over the death of his wife from cancer five months earlier. He is interred at Calvary Cemetery, Queens, New York. Alfred E. Smith was a notable U.S. politician during the early decades of the twentieth century. He was a multiple winner of the New York Governer's seat and made a fair showing in the 1928 presidential election. His Catholic beliefs and Irish identity characterized Smith and helped him to set precedents in the American political arena. Alfred E. Smith Vocational High School in the South Bronx. ↑ Robert A. Slayton, Empire Statesman: The Rise and Redemption of Al Smith. (New York: Free Press, 2001), 480. ↑ Michael J. Hostetler, "Gov. Al Smith Confronts the Catholic Question: The Rhetorical Legacy of the 1928 Campaign," Communication Quarterly 46 (1998). ↑ Allan J. Lichtman, Prejudice and the old politics: The Presidential election of 1928. (Chapel Hill: University of North Carolina Press, 1979). ↑ Carl N. Degler, "American Political Parties and the Rise of the City: An Interpretation," Journal of American History 51 (1) (1964): 41-59, JSTOR Retrieved November 6, 2007. ↑ David G. Lawrence, The Collapse of the Democratic Presidential Majority: Realignment, Dealignment, and Electoral Change from Franklin Roosevelt to Bill Clinton. (Boulder, CO: Westview Press, 1996), 34. ↑ Christopher M. Finan, Alfred E. Smith: The Happy Warrior. (New York: Hill and Wang, 2003). Bornet, Vaughn Davis. Labor Politics in a Democratic Republic: Moderation, Division, and Disruption in the Presidential Election of 1928. Washington, DC: Spartan Books, 1964. Labor Politics in a Democratic Republic Retrieved November 6, 2007. Carter, Paul A. "Deja Vu; Or, Back to the Drawing Board with Alfred E. Smith." Review of Prejudice and the old politics: The Presidential election of 1928, by Allan J. Lichtman. Reviews in American History 8 (2) (1980):272-276. Craig, Douglas B. After Wilson: The Struggle for Control of the Democratic Party, 1920-1934. Chapel Hill: University of North Carolina Press, 1992. After Wilson Retrieved November 6, 2007. Degler, Carl N. "American Political Parties and the Rise of the City: An Interpretation." Journal of American History 51 (1) (1964): 41-59. JSTOR Retrieved November 6, 2007. Finan, Christopher M. Alfred E. Smith: The Happy Warrior. New York: Hill and Wang, 2003. Hostetler, Michael J. "Gov. Al Smith Confronts the Catholic Question: The Rhetorical Legacy of the 1928 Campaign." Communication Quarterly 46 (1998). Moore, Edmund A. A Catholic Runs for President: The Campaign of 1928. New York: The Ronald Press Co., 1956. A Catholic Runs for President Retrieved November 6, 2007. Neal, Donn C. "What If Al Smith Had Been Elected?" Presidential Studies Quarterly 14 (2) (1984): 242-248. Rulli, Daniel F. "Campaigning in 1928: Chickens in Pots and Cars in Backyards," Teaching History: A Journal of Methods 31 (1) (2006): 42+. Campaigning in 1928 Retrieved November 6, 2007. Smith, Alfred E. Progressive Democracy: Addresses & State Papers. New York: Harcourt, Brace, and Co., 1928. Progressive Democracy Retrieved November 6, 2007. Sweeney, James R. "Rum, Romanism, and Virginia Democrats: The Party Leaders and the Campaign of 1928." Virginia Magazine of History and Biography 90 (October 1982): 403–431. Alfred E. Smith Dies Here at 70; 4 Times Governor The New York Times, October 4, 1944. Happy Warrior Playground New York City Department of Parks and Recreation. Governor Alfred E. Smith Park New York City Department of Parks and Recreation. Lost Warrior: Al Smith and the Fall of Tammany by Kevin C. Murphy. History of "Alfred E. Smith"
This page was last modified on 2 March 2019, at 23:52.